I originally shared this recipe on May 22, 2012. I have updated the images and some of the text today. You know that sinking feeling you get when you’ve been invited to a party and know you have to bring some kind of impressive food situation, but are feeling overwhelmed (1) because you don’t have a ton of time and (2) because you have no idea what that particular impressive food situation will be. Well, worry no more! 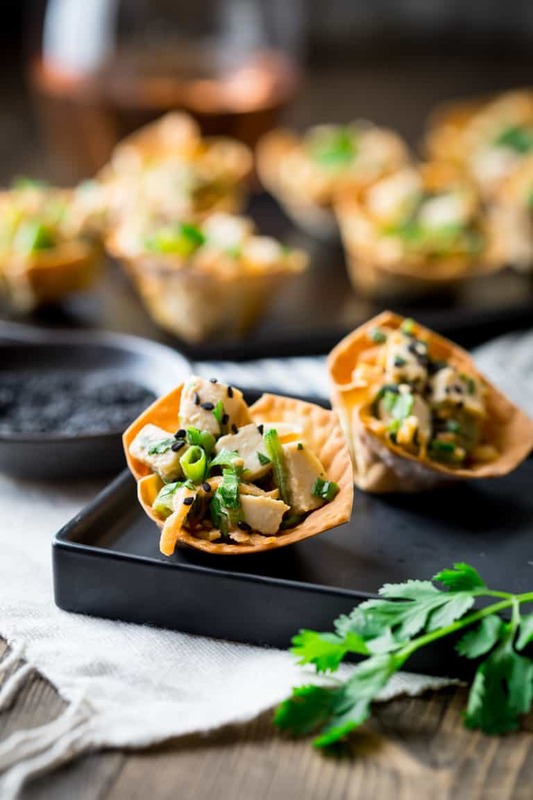 These Sesame Wonton Cups are the perfect solution. 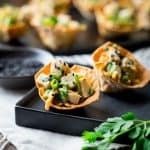 A super yummy and quick chicken salad is spooned into these awesome crispy wonton cups and boom you’re done! The only thing left to do is prepare yourself for all of the swooning and adoration that will be coming your way. I can’t say enough about this chicken salad. Tender chunks of chicken are tossed with an absolutely delicious sweet and savory dressing made with tahini, tamari, mayonnaise and you guessed it… maple. I then added snow peas, carrots, scallions and a sprinkling of fresh herbs to brighten it up and add texture. 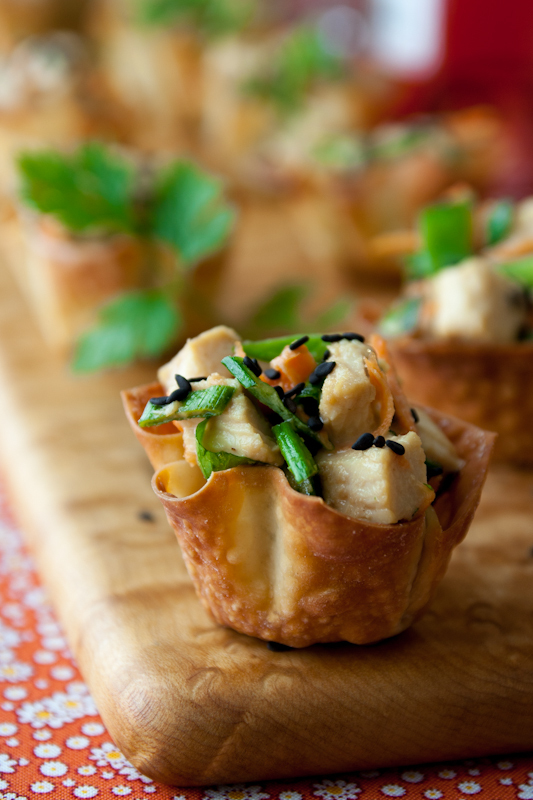 It is awesome on its own, but even better in the wonton cups! 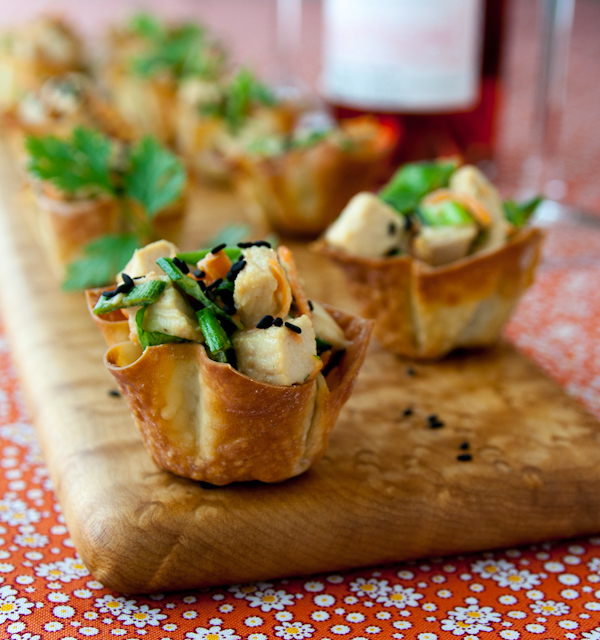 Check out how to make these crispy little cups here! 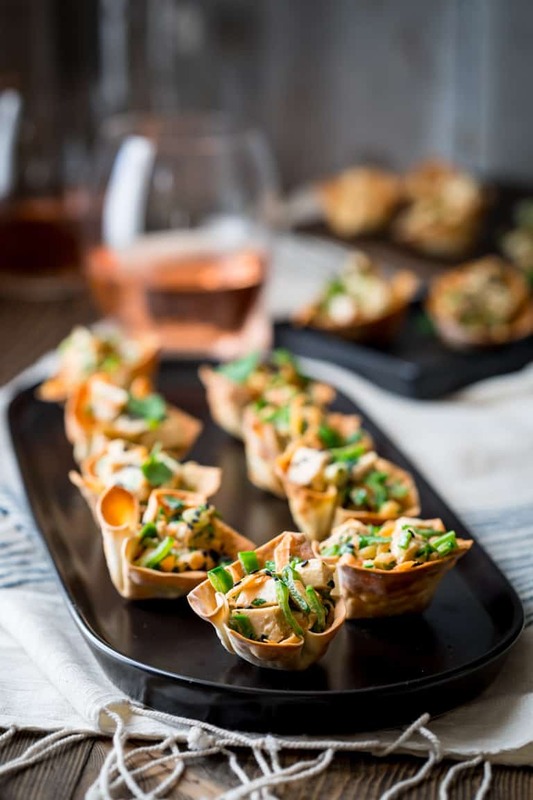 Make crispy little wonton cups for individual hors d’oeuvres. Buy wonton wrappers. Look for them in Asian markets or in large supermarkets, usually along side the tofu. Cut off the corners, and then you pat them into mini muffin pans. Then give them a quick coat with cooking spray and bake them just until crisp and golden. They form a hard little shell. Like a mini tortilla bowl. Then you can fill them up with yummies like this Asian inspired sesame chicken salad. Or you can go south-west and make a mini taco salad, or fill them with ceviche with mango and cilantro. The possibilities are endless. They are so fun for a passed hors d’oeuvres for a cocktail party. 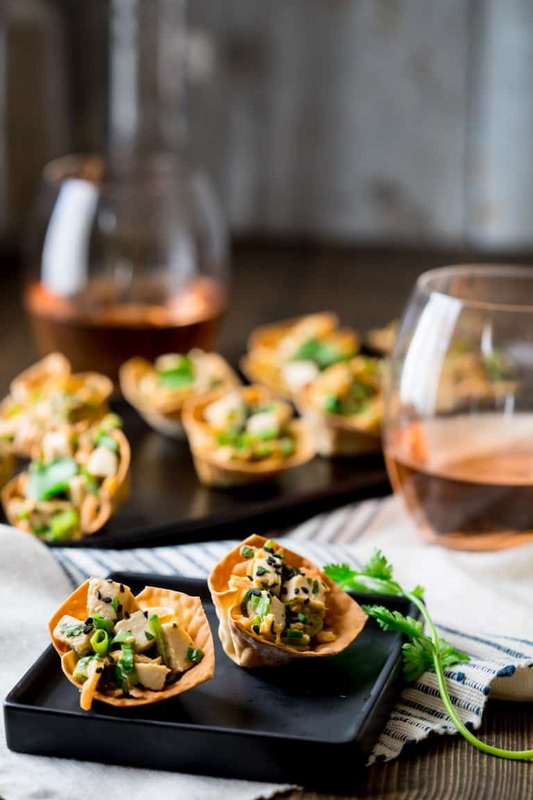 And don’t miss checking out these 15 Minute Chicken Salad Bites with Cranberries and Walnuts! Or these vegetarian Mini Tacito Salads. With this arsenal of awesome little appetizers in your back pocket this Holiday season is going to be a breeze!! Here, check out how easy they are to make! To make ahead: Can be prepared through step 3 up to 6 hours in advance. 24 wonton wrappers, about 6 oz. Place chicken breast in a medium skillet and cover with cold tap water. Place over high heat and bring to a simmer. Reduce heat to maintain a gentle simmer and cook until the chicken is no longer pink in the center and cooked through, 8 to 12 minutes, depending on thickness of the meat. Remove the chicken and let cool. Cut chicken into small cubes. Meanwhile, Preheat oven to 350°F. Coat two 12-cup mini-muffin tins with cooking spray. Cut corners off wonton wrappers to make an octagonal shape. Gently press wrapper down into each cup. Lightly spritz wrappers with cooking spray. Transfer the pans to the oven and bake until the wrappers are starting to turn golden brown and are crispy and bubbling, 10 to 14 minutes. Let cool completely. Whisk tahini, soy or tamari, maple syrup and mayonnaise in a medium bowl until smooth. Stir in the chicken and refrigerate until cold, 40 minutes to 1 hour. Stir snow peas, carrot, scallions and herbs into chicken mixture. 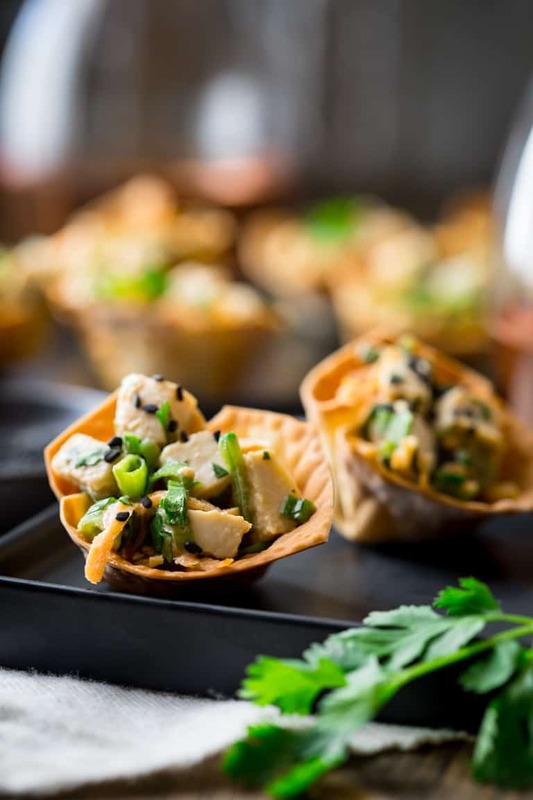 Divide chicken salad among wonton cups, about 2 scant tablespoons each. Garnish with sesame seeds, if using. Serve immediately. Retro is in! 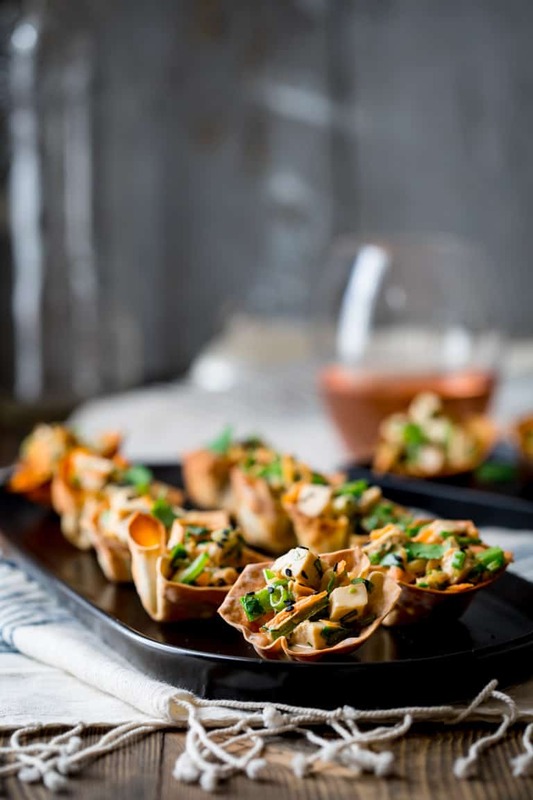 And this wonton cups are definitely something I’d look forward to serving on my next weekend party. Love the neat presentation. Thanks for sharing! i totally needed a way to use up my left over wonton wrappers, thanks for the idea! Glad I could help. And it would work with left-over chicken if you have that too. These sound amazing! Look the flavor combination and these seem like the perfect appetizer! Thanks Vicky, I agree, they are a nice make-ahead option to add into the mix. Thanks for dropping by. I will definitely try this! Looks yum yum! Thanks Katie, I made these for superbowl Sunday and they were a big hit. I think I’ll make them again for a doula potluck tomorrow. thanks so much for the feedback. I am so glad you liked them so much. I’d love to know how the other Doulas like them. Happy cooking! How long do you think the little cups will stay fresh if they are not filled? Do you think I could bake 2 days in advance? I made them the day before and stored them (once they were cool) in a Ziplock bag. I didn’t try 2 days, but my guess is they would be fine. Just taste one before filling. You may need to re-crisp them quickly in the oven. This is a GREAT recipe – thank you. I used the circle pot sticker skins and they worked perfectly! I also added toasted sliced almonds and purple cabbage for some color. Thanks for sharing your recipes! Great idea to use the circular potstickers! I am so glad you like this recipe! I don’t have tahini. Can I leave it out or substitute with peanut butter? actually, just substituted sesame oil and it’s fine. Oh my goodness…I stumbled upon this recipe and absolutely LOVE IT! I first made it for the Super Bowl and we all fell in love with it..I now make it at least once a month for dinner. OMG sooo good! Thank you for the recipe! Thank you so much Deborah. We love this one too. It is a keeper for sure. Great recipe! Do you know if they can be made a day or two in advance and still be fresh for serving? 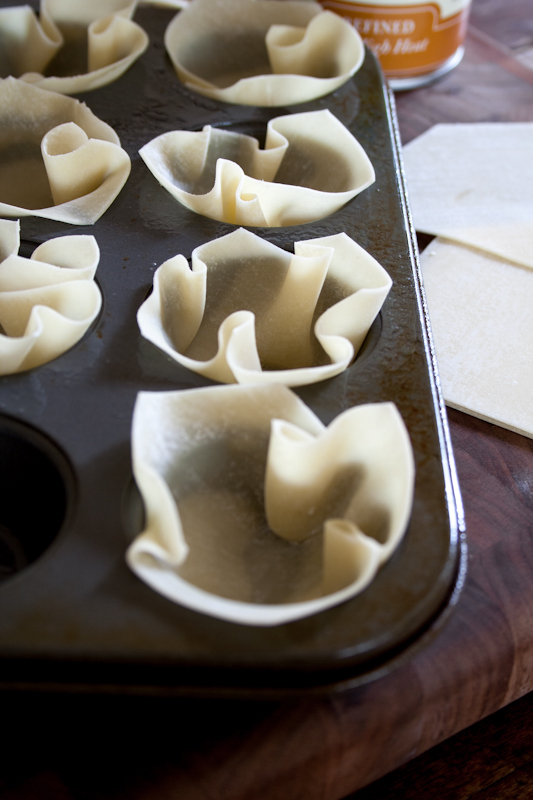 The wonton cups can be made ahead, once they are cooled, store them in an airtight bag or container. If they loose their crispness, you can pop them on a sheet pan and crisp them up for 2 to 3 minutes in the oven. The chicken salad cannot be stirred together in advance. You can however, mis en place the ingredients for it, and then stir them all together before serving. Gorgeous as always. Love using wonton wrappers, they are so easy to work with! 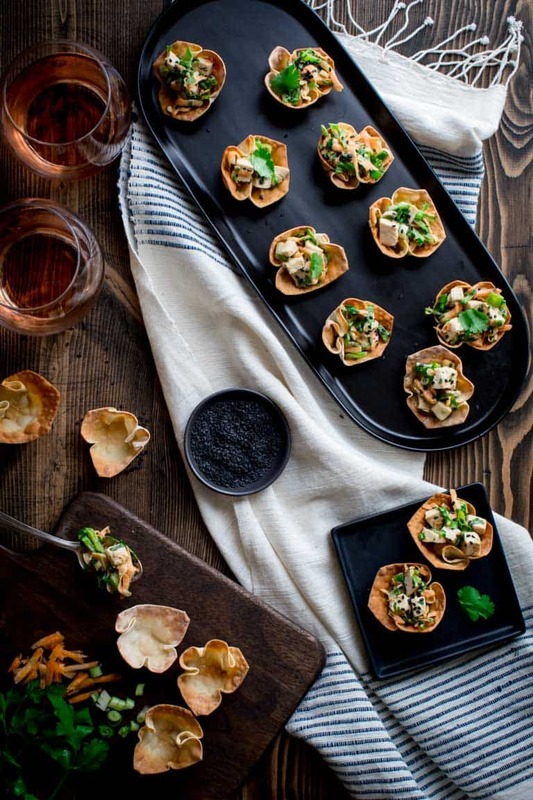 These are gorgeous and would make a lovely addition to NYE appetizers. Thanks for sharing! Sorry but I thought this was absolutely disgusting. Eww. Such a fun idea! 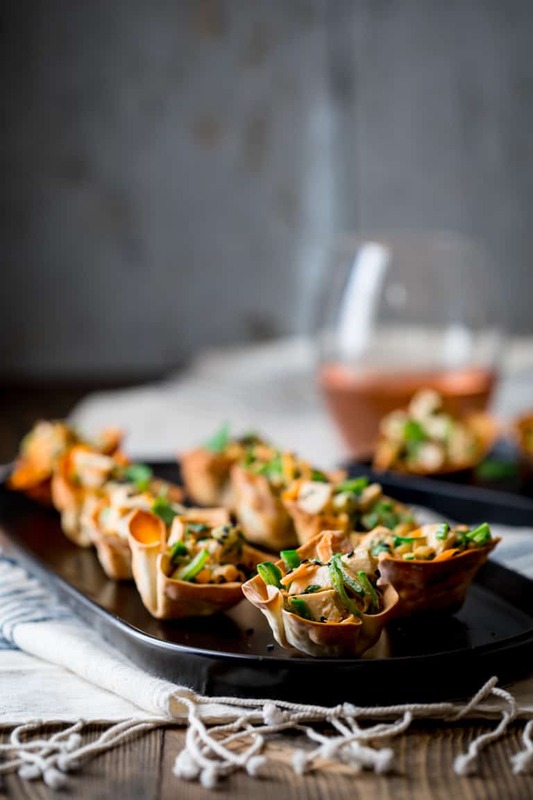 I’ve yet to find a ready made gluten free wonton wrapper, but I might be tempted to make my own, just so I can eat these yummy wonton cups! Let me know if you do find one, because I know a lot of readers here are also gluten-free so they’d appreciate the tip. Yes for sure! I think that I’d probably use baked tofu for the best texture.